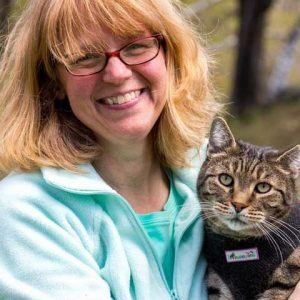 "I started out by giving a small donation to a local group in Newburyport..."
Stacy has over 20 years of experience in animal rescue and in working with Community Cats. She currently hosts a podcast called the Community Cats Podcast where she interviews nationally and internationally renowned experts helping with the problem of cat overpopulation and cat welfare. The Community Cats Podcast recently crossed the 200 episode mark, and continues to spark conversation and highlight innovations in animal rescue. Q: How did you first get involved in animal rescue? Q: What drew you to cats over other animals? Q: What advice do you have for someone wanting to start their own podcast? Q: How do you bring awareness to the public about community cats? ”Stacy is just one of many wonderful volunteers that selflessly offers her help to better the lives of animals.